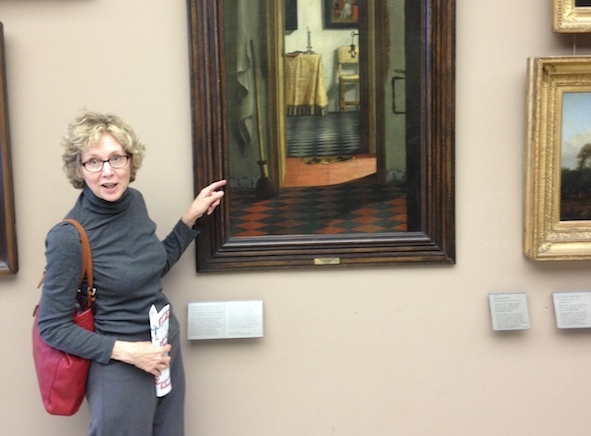 We were having a discussion about art – which shouldn’t surprise you! As you know, I am always saying that art can be about anything and to prove it I googled “art and tea”. What came up in the search was so interesting that I thought it would be fun to share it with you. As you know, I have a bit of a tendency to be a bit school-teacherish and added some comments to explain them – but you don’t have to read about them if you don’t want – the art, like all good art, speaks for itself. People started drinking tea in China a long, long time ago. And the Chinese were the first people to make drinking it a ceremony, something special that people did together to enjoy themselves and relax. Here is a very old painting called Tea Party In Hui Hills by the most famous calligrapher and artist of the Ming Dynasty, Wen Zhengming done almost 600 years ago. The Japanese who live right next to the Chinese also drank tea they (they learned this from the Chinese), and they had special tea houses and a lovley tea ceremony they became famous for. I actually don’t know when this painting was done or who painted it but I thought it very pretty. In Russia, people make tea in a samovar which you can see in this charming painting by Abram Arkhipov done in the 1890s. Samovars were very simple for the peasants or very fancy for royalty. But whether formal or imformal, tea drinking was and is a very important part of Russian life. Here they even have their samovar at a picnic! This painting, called 5 O’clock Tea, was done a long time ago, in 1880, by one of the few women painters who were around. Her name was Mary Cassatt. It wasn’t really fair that women weren’t allowed to do the same things as men – but she managed to be quite successful. She painted many scenes about women’s home life, which was unusual for the time. In this picture, it looks like they are listening very carefully to someone, doesn’t it? Must have been an interesting tea party – wish I could have been there. And the silver is very nicely painted, don’t you think? 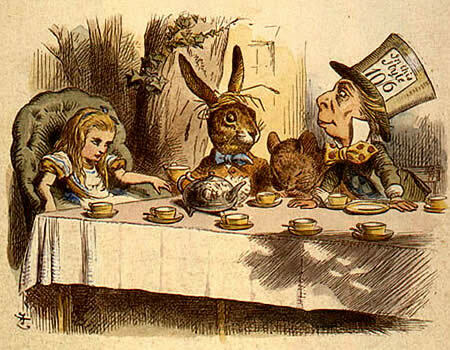 One of the most famous tea parties of all time: The Mad Hatter’s Tea Party! John Tenniel illustrated this wonderful children’s book, Alice in Wonderland, that we are all so familiar with, in 1860. His pictures are the most famous of all the illustrations ever done for the story. Even Walt Disney was influenced by them when he made the cartoon version. It’s hard to say, but it doesn’t look like Alice is having all that great a time, does it? Oswald joked that perhaps the cup of tea will help this lady pull herself together (hee hee). This is done in the cubist style which was a very new way of painting about 100 years ago. It is called Woman with a Teaspoon done in 1911 by Jean Metzinger. Cubist painters wanted to show that they looked at things from many points of view at the same time. This is a really weird one. It’s what they call Surrealism – which is making what couldn’t possibly be real to look real. It is called Object and was done by a woman artist also, Meryl Oppenhiem, who loved to be unusual. She made this in 1936 and it was quite outrageous at time. This isn’t a picture of a tea cup or a tea ceremony but it is about a story of a tea party that I heard about a long time ago when I was in university. My teacher told it to the class. When he was a young man, he was invited to tea by a famous Canadian painter called Emily Carr. She was quite eccentric (remember we used that word when we were describing Oswald? – he was quite flattered, by the way). Well, when my teacher went to visit her, she had forgotten she had invited him and said the only thing she had in the house was a head of lettuce. She went and got it and put it on the table, and at that moment the third creature in the little cabin, her pet monkey Woo who you see in this painting she did in the 1930s or 40s, swooped down from the rafters and grabbed it and took it back up to her perch in the ceiling. And that was the end of the tea party! I received your paintings by the way and have them up on the wall at the art school – they are very beautiful and admired by all. Thank-you very much. I’ll write again soon – and send some sketches for your Tree House gallery next time.